at the Executive Mansion (Photo taken by Billy Ball). The legislation, which he characterized as “a sigh of relief that came too late,” phases in class size caps for grades K-3 over the next four years and offers recurring funding for arts, music and physical education teachers that might have been crowded out by districts’ search for cash to fund new classroom educators. “The class size chaos that this legislature started caused agony and anger and angst across this state for no reason,” said Cooper. Meanwhile, Cooper said the deal only “partly” resolves the state’s class size headache, pointing out that—as Policy Watch reported today—the accord comes with no funds for school districts’ construction needs arising from the state mandate. Cooper said school superintendents were “wringing their hands not knowing what to do” over the infrastructure issues. Many districts will have to spend millions to find new classroom space. Additionally, the state continues to grapple with a teacher shortage that may vex local school leaders’ efforts to fill more classrooms, a point brought up by the governor Wednesday. “A smaller class size doesn’t do much good with no teacher in it,” Cooper said. 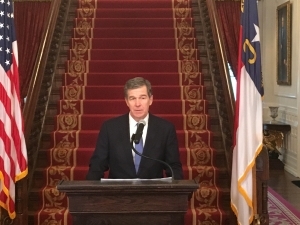 Cooper’s decision likely has little impact on the bill’s fate, considering the GOP-dominated General Assembly has a veto-proof voting majority on the legislation. Republicans described the package bill, delivered as a conference report on House Bill 90 last week, as pulling together multiple, urgent issues, including a still-brewing court battle over an elections and ethics board merger, as well as a $58 million environmental mitigation fund that Cooper announced shortly after the pipeline received its permits. GOP lawmakers say Cooper doesn’t have the authority to oversee that fund. They also suggested the Democratic governor negotiated a “quid pro quo” arrangement to secure the pipeline, which Republican legislators also support. Cooper said Republicans’ actions “imperiled” that mitigation fund, arguing that he wasn’t sure what would become of the funding now. Legislators say they want to spend the cash on school districts along the pipeline’s route. The governor also chided GOP legislators for another attempt to merge state elections and ethics boards, a move seen as curbing Cooper’s appointment powers. The state Supreme Court ruled in Cooper’s favor in an ongoing lawsuit over the boards, and a lower court is expected to decide soon how to proceed. Remember – the $58 million was in addition to $11 million that was already being paid by Duke under the environmental rules and laws to mitigate. It is surprising that NC Policy Watch doesn’t mention this. In other words, mitigation was already taken care of under the law. Cooper extorted this money from Duke in violation of countless laws. This administration is really keeping the US attorneys office busy.